où l’on fait des maths en Anglais. Utah French Dual Language Immersion teachers receive $17,000 from the Dual Language Fund through French Embassy and the FACE Foundation! Congratulations to Oak Hollow 3rd grade teacher Sunny Hafen who received a $10,000 Canyons School District Innovation Grant! French author Francois Librini visits Churchill, Foxboro, Fox Hollow, Morningside, and Odyssey Elementary Schools. Born March 4th, 1969, in Boulogne sur Mer in Northern France, François Librini grew up in Auvergne in central France, near Clermont-Ferrand. Librini especially enjoyed writing in primary school, writing his first novel in 4th grade. He finished his studies at age 23 at the Ecole Supérieure du Commerce in Bordeaux, but eventually returned to Auvergne where he became a primary school teacher. As a drummer, Librini started a band that became locally famous, but he decided to focus his energy on his first passion: writing novels. 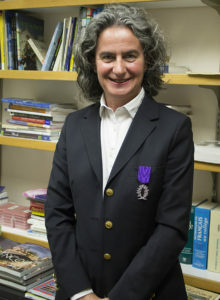 Now known for his engaging children’s detective novels, Librini wrote his first novel À plein tube in September 1999, which was published by Magnard Jeunesse in 2002. 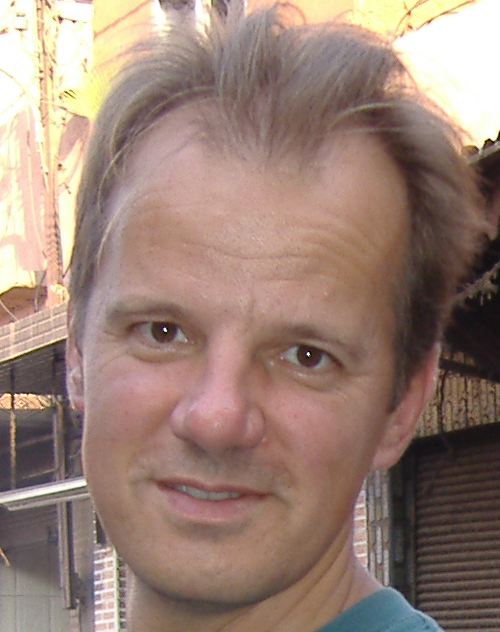 Magnard Jeunesse also published À fond de train (2003) and L’inconnu du 13 octobre (2004). Oskar Jeunesse published 120 ans plus tard (2007), Coup de tabac (2008) and École buissonnière (2012). 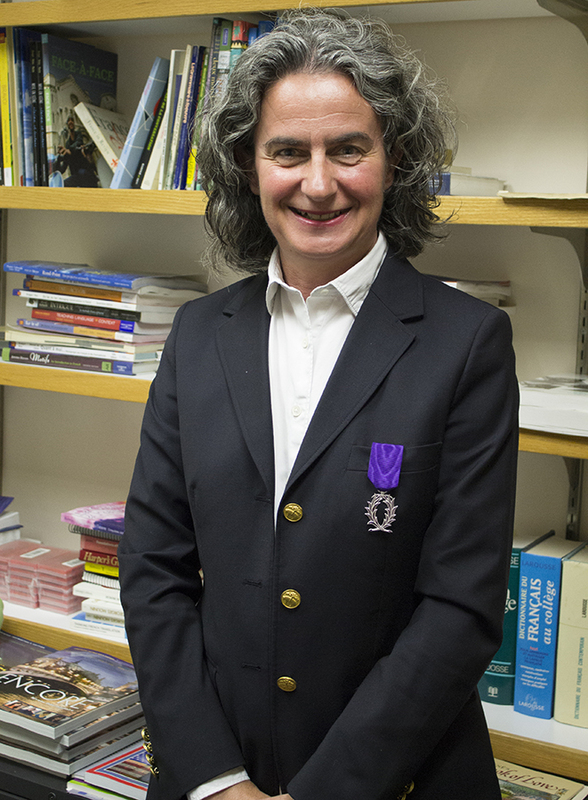 Librini currently teaches full-time, but he occasionally visits classes to organize creative workshops and to tell students about the life of an author. At Trailside, the lesson du jour is money basics. 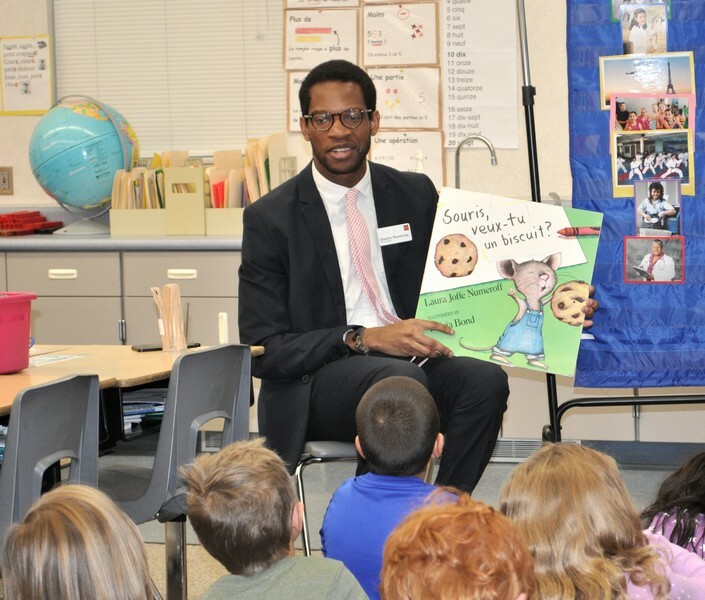 Alasdair Ekpenyong, a Wells Fargo banker, reads in French to a first-grade dual-language immersion class at Trailside Elementary School on Monday as part of a financial literacy lesson. He says the earlier students can begin learning the basics of how to be responsible with money, the better. Read more. 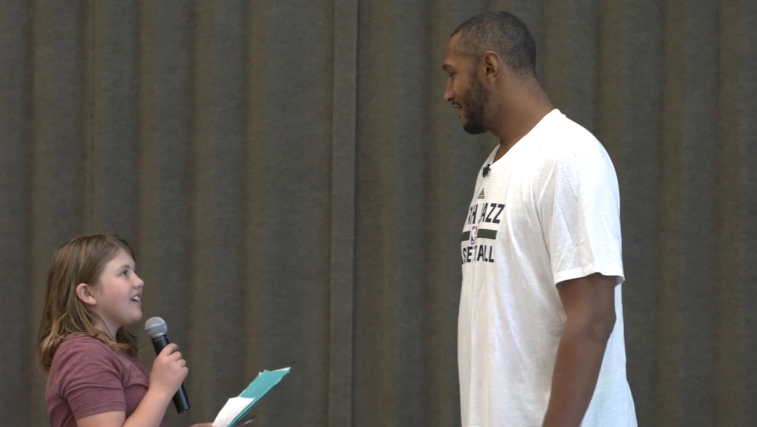 Boris Diaw hosted a French immersion assembly at Butler Elementary school in Cottonwood Heights last week – communicating in French and encouraging the kids to keep learning. Click image for video.